Back flushing helps to remove corrosion build up from inside your radiator and restore optimal flow. To back flush your radiator you will first need to remove it from your car, details of how to do this are available in either the owners or the workshop manual. Once the radiator is removed, you can clean any debris from the cooling fins. This is best done with an airline and a soft scrubbing brush. Remember when using the scrubbing brush to brush in the direction of the cooling fins, brushing across them will damage them and prevent airflow through the radiator. Having cleaned the outside of the radiator, turn the radiator upside down and place a hosepipe so that water is running in the opposite direction to normal flow. Allow the water to flow until the water exiting the radiator is seen to be free from debris. Once the radiator has been flushed and the cooling fins on the core cleaned then you can repaint your radiator if required. If you are planning to repaint your radiator then make sure to use a suitable paint such as Eastwood’s Gloss Radiator Paint. Other paints that are not designed for use on radiators will interfere with the heat transfer and also block airflow as they will clog up the core of your radiator. Split and cracked water hoses leave your car susceptible to overheating caused by loss of coolant. This is a common and much overlooked problem area. It is worth investing in a new set of hoses and hose clips, These will prevent coolant escaping and help to maintain the integrity of your cooling system. The effects of an overheated engine on your oil are a much overlooked area. As your engine reaches operating temperature your oil gets hot and loses some of its viscosity. If the engine gets too hot, then oil can become too thin and it will lose some of its protective qualities. 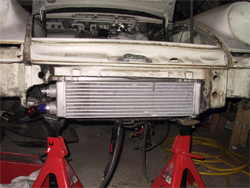 Fitting an oil cooler is a simple task, but placement is the key to optimal airflow. You must find a suitable location that allows air to flow over your newly fitted oil cooler without having it block too much of your radiator.